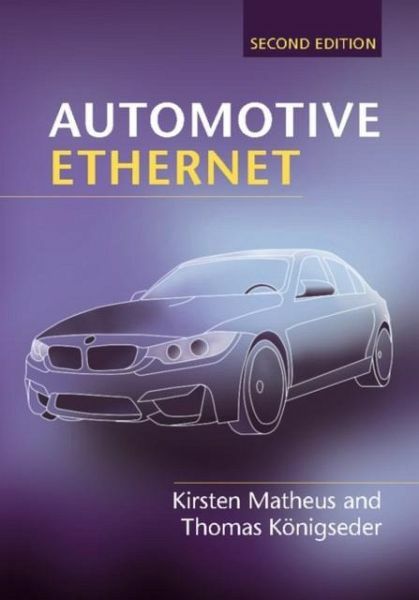 Learn about the latest developments in automotive Ethernet technology and implementation with this fully revised second edition. Including approximately twenty-five percent new material and greater technical detail, coverage is expanded to include: * Detailed explanations of how the 100BASE-T1 PHY and 1000 BASE-T1 PHY technologies actually work * A step-by-step description of how the 1000BASE-T1 channel was derived * A summary of the content and uses of the new TSN standards * A framework for security in Automotive Ethernet * Discussion of the interrelation between power supply and automotive Ethernet communication Industry pioneers share the technical and non-technical decisions that have led to the success of automotive Ethernet, covering everything from electromagnetic requirements and physical layer technologies, Quality of Service, the use of VLANs, IP and Service Discovery, and network architecture and testing. This is a guide for engineers, technical managers and researchers designing components for in-car electronics, and those interested in the strategy of introducing a new technology. Thomas Königseder is a communications engineer who manages the team for electromagnetic compatibility at BMW. In 2008, he was responsible for launching the first car with an Ethernet connection. 1. A brief history of 'Ethernet' (from a car manufacturer's perspective); 2. A brief history of in-vehicle networking; 3. A brief history of automotive Ethernet; 4. The physical transmission of Automotive Ethernet; 5. Protocols for automotive Ethernet; 6. Ethernet in automotive system development; 7. Outlook.